Last week, Stanbridge College welcomed Dr. Daniel Fletcher, DVM, of Cornell University’s College of Veterinary Sciences, and the first high-fidelity canine patient simulator in the world. 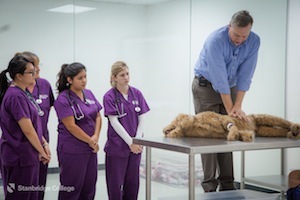 Under Dr. Fletcher’s guidance, Stanbridge College Veterinary Technology students trained with the simulator to learn the proper procedures and techniques for administering CPR on a simulated canine with real-time physiological feedback. Dr. Daniel Fletcher demonstrates how to conduct CPR on the world's first simulated canine patient for Stanbridge students. Combining his PhD in Bioengineering and his Doctorate in Veterinary Medicine, Dr. Fletcher designed a canine patient manikin to allow veterinary and veterinary technology students to practice making clinical decisions and see the results in real-time within a safe environment for them and the animals they would be treating. The manikins replicate scenarios including heart and lung sounds, pulses that can be palpated and other functions that could occur during anesthesia such as changes in oxygen levels, blood pressure, and respiratory rate. These changes trigger alarms and reactions for students to troubleshoot. Veterinary Technology students practice CPR on the simulated canine patient. The manikin can relay physiological feedback to a student and also collect data about what the student is doing to provide feedback to the student for evaluation. 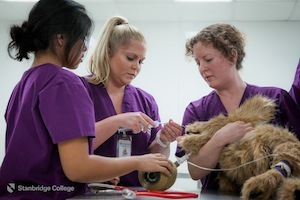 In August of 2013, Stanbridge College launched its Associate of Science in Veterinary Technology degree program, the first in Orange County. The program prepares students to receive their licensure to work under the supervision of a veterinarian, providing medical assistance in animal hospitals, shelters, research, or zoos. Students train on live and simulated animals to learn about the different kinds of animals and their breeds. In addition to a fully simulated Surgical Suite, X-ray room and examination skills lab on campus, Veterinary Technician students train in shelters and clinics around Orange County for hands-on experience. Earlier this year, the program hosted its first Pet Exam and Vaccine Clinic on-site at its Veterinary Technology Skills Lab to provide discounted services and vaccines to dogs from the Basset Hound Rescue of Southern California and pets from the public. To learn more about Stanbridge College, please visit www.stanbridge.edu.